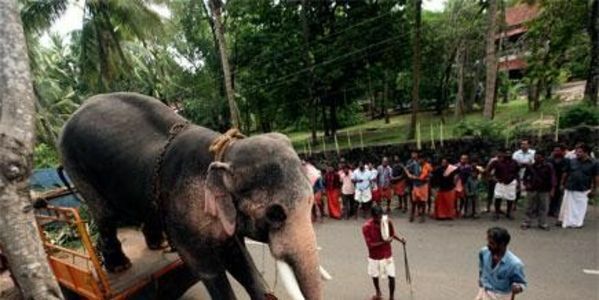 Rama (Thechikkotkavu Ramachandran) is a famous elephant in Asia - but he's being beaten and treated cruelly by the people who are profiting from his performances. Rama is the star elephant of elephant festivals in South India, and gets the highest money reward in festivals in Kerala. When Rama refused to lift his head in an illegal elephant head-lifting competition, he was beaten cruelly. In head-lifting competitions, owners force elephants to hold their heads and trunks up in the "salute" posture typically seen in the circus. The winning elephant is the one that keeps his head up the longest - but it's a position that is painful and uncomfortable for elephants, putting straing on the neck and trunk and impairing their ability to breathe. The police took the mahout to the police station but he was released instead of being penalized for beating this poor animal. A few days later when the elephant was taking part in a festival the mahout began to beat him again. Rama has been partially blinded by his handlers to control him. He's so thin that his spine shows through his skin. This iconic elephant needs proper medical care and food! Sign this petition to demand the arrest of Rama's handler for animal abuse, and ask for Rama to be sent to a sanctuary where he can receive proper medical care! Forest Department Kerala Prime Minister of India(Chairman of National Board for Wildlife,New Delhi) Chief Wildlife Warden,Kerala Secretary,Animal Welfare Board of India District Collector,ThrissurRama (Thechikkotkavu Ramachandran) is a famous elephant in Asia - but he's being beaten and treated cruelly by the people who are profiting from his performances. Almost 120 000 000 people from all over the world have signed for Rama: please listen to their voice and save This elephant!